You are here: Home / Dog Health / Altitude Sickness: Can Dogs Get it Too? People sometimes get altitude sickness when they reach an elevation of 8,000 feet or higher. I knew it was a possibility that someone would get sick on our recent trip to Colorado. People who live in Colorado are used to the altitude. People who travel there, especially sea-level dwellers like us, can get quite a shock to their system. It can take anywhere from a couple days to several months of living at higher altitude to fully adjust. The main goal of our trip was to visit Leadville and hike couple of 14ers – peaks that exceed 14,000 feet. The town of Leadville itself sits at an elevation of 10,000 feet, which is already above the elevation threshold where altitude sickness can occur. We planned to climb one of the “easiest” 14ers – Mt. Sherman – and the second highest mountain in the contiguous United States – Mt. Elbert. Mt. 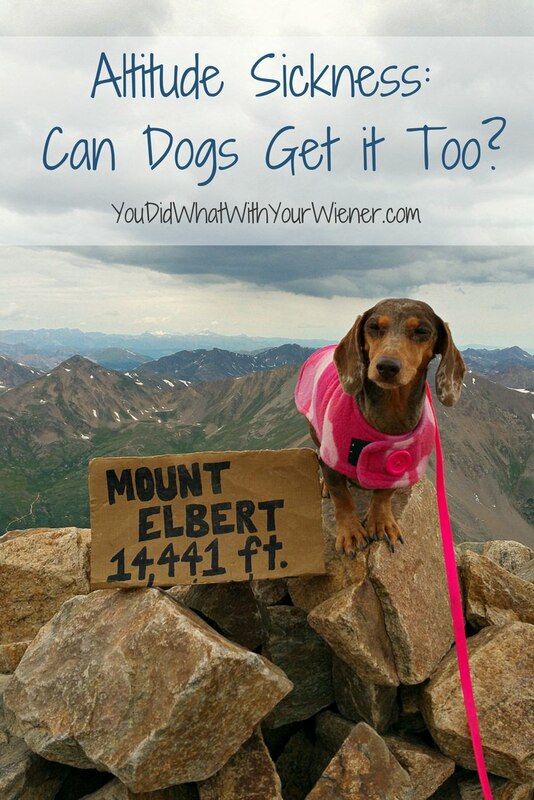 Elbert is the highest peak in the contiguous United States that dogs are allowed on. I was curious if Chester and Gretel could get sick too so I researched it before we left. It turns out that dogs CAN get altitude sickness. Altitude sickness happens because the air is is “thinner” at elevation and the or dog can’t get enough oxygen. Unfortunately, dogs can’t tell us when they feel bad and will often push themselves to please you. It’s important to know the symptoms of altitude sickness so you can recognize when your pup may be in trouble. Prevention is the best medicine but it’s not a guarantee that your dog won’t get altitude sickness. To prepare, it’s best if you can stay for several days to weeks at higher elevation to acclimate before the hike. That is not always realistic if you are on a quick trip. If something still seems off after you do the above, get them to a veterinarian as soon as possible. There may be something else going on. We had been in Colorado for a couple of days, but at a lower elevation than Leadville, when we attempted to hike Mt. Sherman. Right away, Chester was hiking super slow. We chalked it up to his old age and put him in my backpack. 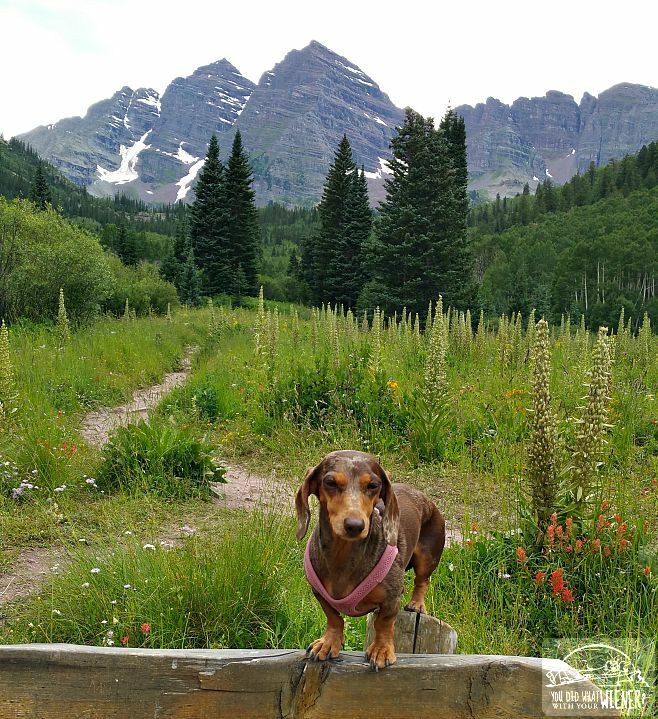 Gretel wanted to charge to the top as usual so we let her hike. It’s turns out that this “easier” 14er wasn’t easy at all. Once we crossed the initial meadow, it headed straight up this boulder field and scree slope. It was STEEP! I started feeling weak. I was staying alert for signs of altitude sickness but, at that point, I figured most of my difficulty was due to the extra 15 lbs in my pack. We continued to follow Gretel up the mountain, stopping for a breather every few hundred feet. In less than two miles I started feeling a little sick to my stomach and getting a bit of a headache. Shawn took over wearing Chester and we decided to turn around. I know that altitude sickness can be bad. I also know many people that have pushed themselves to a point of being physically sick – like my little brother who climbed Mt. Kilimanjaro – and been totally fine once they hiked down. However, I also knew it is something that should be taken seriously and that it can take some people over a week to recover. Since we were only going to have 4 more days in Leadville to try and climb Mt. Elbert, I decided quit while I was ahead. Up to this point, neither of the dogs had been showing signs of altitude sickness. I wouldn’t really expect it from Chester since he was getting a lazy ride up the mountain. Gretel seemed unphased too. It was a different story for the next few days though. While Gretel never showed any clear signs if altitude sickness, she was definitely acting different. She was squinting more. Now, she has sensitive eyes, and sun at higher elevations can be ore intense, so it could have been that except that she wasn’t like that for the previous 3 days in Colorado. Someone suggested that she might have a doggy headache but, honestly, it’s hard to prove that. It could have been. The biggest thing was how exhausted and sluggish she was. She slept way more than usual. When she was awake, she always looked like she was just waking up from a deep sleep. Note: It was NOT determined that she was experiencing altitude sickness but I wanted to take precautions to prevent it. We took it easy around town the next couple of days. Everyone told me that drinking lots and lots of water – “so much that you are drowning” to be exact – would help so I made sure to hydrate as much as I could. I tried taking my severe headache medicine but it wasn’t helping. So I did what you do and took to Mr. Google to see if something else would help. It turns out that plain ol’ ibuprofen can help with altitude sickness. I made sure that Chester and Gretel got extra water. I even mixed a little Gatorade in some water to flavor it and add electrolytes (I don’t recommend this on a regular basis but, after checking that there was no xylitol it in, I figured that the benefits were worth incorporating it short-term). We used our down-time to drive the Top of the Rockies National Scenic Byway and look at all of the old, abandoned mine ruins. We took a day trip to Aspen to see the famous Maroon Bells and had a wonderful lunch. We spent a day catching up on emails and wandering around Leadville. My stomach continued to feel a little icky. By the third day of rest I was feeling a lot better. Gretel seemed back to her normal self too. We attempted Mt. Elbert on our final day in Leadville… and made it! It stands to reason that dogs could be effected, just like people. What a bummer though, I know you had high hopes to hike those peaks. Oh, it wasn’t a bummer. Our main goal was to hike to the top of Mt. Elbert – which we were able to do at the very end. Mt. Sherman – the one we had to turn back on – was just an “easy” warm up. It turned out that Elbert was easier! But buy, it sure wasn’t easy. Toward the end, I swore I was quitting at least 50 times. The fact that I kept going and actually made it was a very joyous accomplishment. I can get altitude sickness on a stepladder. That’s why I live my life at sea level, but I do enjoy pictures taken in the mountains. That’s funny. My Dad has really bad motion sickness and he always says he can get sick watching a merry-go-round. I am lucky that I don’t seem to get altitude sickness. A few years ago I was at a conference in Denver and half the people felt sick from the change. Glad it passed for you. It sounds like you all did a good job of staying alert to serious issues and taking care of yourselves. Glad you were able to push through and accomplish your goal by the end. It may be that your body needed the extra time to get acclimated. I remember traveling to a conference where I met a woman from Colorado. She said that alcohol affected her differently in New Orleans than it did when she was home in the mountains. But I can’t remember if it hit her harder or didn’t do a thing. I know something about altitude sickness as I’ve been to Tibet, and that is high! I remember the first time in Denver having the headache though. A lot of people on our trip to Tibet/China got a prescription from their doctors for altitude sickness beforehand. The water is the trick I think, those that drank beer the two days on the train regretted it when we got there. I remember being out of breath walking fast with luggage. We even had oxygen in our hotel rooms. Its sad about how it affects the dogs as they can’t tell you how they are feeling. But I think Gretel did have a headache. Glad you listened to your bodies and took it easy, and most of all that you completed the hike. Glad you are doing well now. When I hiked Mt. Whitney in 2001, so long ago, I was doing great and did not succumb until I had hit the summit. It was not fun getting altitude sickness, I actually felt as if I was having a heart attack. My companions had to take me to the hospital, it was bad but I was in for a week long recovery. So glad you didn’t experience anything that bad. I had no clue! This is good to know, for our future trips. We have four very active dogs and are looking to do a lot more camping and hiking. I’ve never paid much attention to altitude so this will have to be something to keep in mind for some of our next trips. Our most recent road trip in Pisgah and Nantahala National Forest we did hit an elevation of 6k almost 7k at one point, so we got close to that threshold. Great, thanks for the link Larry!